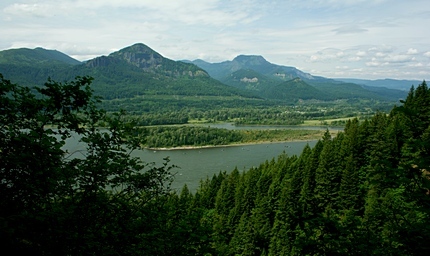 This is one of the many true gems in the Great Columbia River Gorge. Start the hike at the John B Yeon State Park entrance. The trail to Elowah Falls is clearly marked. 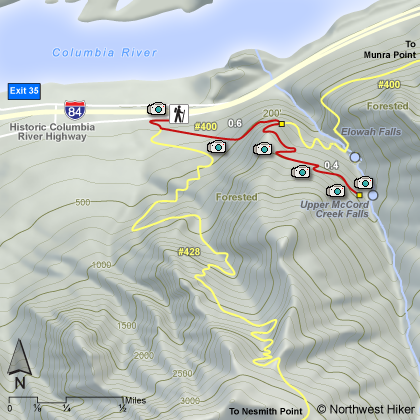 After a short walk west, the trail makes an extreme left turn and in just a few feet you will come to the junction of Trail #400, which heads west toward Nesmith Point, and east toward Elowah Falls. Go east. Follow Trail #400 through dense forest as the trail climbs to the junction to McCord Creek Falls. Bear to your right and follow the trail uphill through a forested area toward McCord Creek Falls. After a number of small switchbacks, you will come out into the open where you begin to enjoy a number of great vistas. Not only do you have a great view of the Columbia River Gorge, but you can also see the top of Mt Adams peeking over the northeastern horizon. The trail is cut into the sheer rock wall of this canyon and has railings for safety. You will be able to view Elowah Falls from the top on this trail just before entering a wooded area and coming to McCord Creek Falls. This double falls is a rare beauty and well worth the hike.